You know how I always interpreted that? These were people so hungry for love that they were accepting substitutes. They were embracing material things and expecting a sort of hug back. But it never works. You can’t substitute material things for love or for gentleness or for tenderness or for a sense of comradeship. 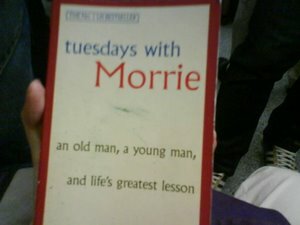 I’m reading Tuesdays with Morrie. And that’s quoted from the book. It felt oh-so-true for me that I HAD to blog about it. And I can’t blog on my phone without a picture so I snapped a shot. Lol. hmm, can i borrow this book after u finish? hee. Tiffie: Yeah, gonna get that 5 people you meet in heaven book.